After you have finished your visit to Tamworth Castle why not explore the beautiful Castle Grounds with their magnificent raised flower beds, there are lots more activities to keep you occupied from river walks and picnics to cycle hire and crazy golf, don't forget to try out the brilliant play area! The bandstand is located at the top of the floral terraces, sitting beneath Tamworth Castle, in the summer brass band concerts are held each weekend (sponsored by Ankerside Shopping Centre). 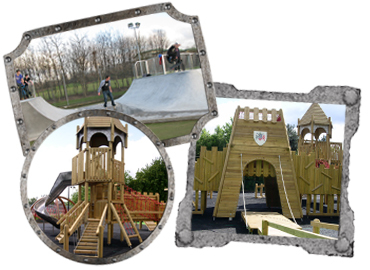 The enclosed outdoor play park includes a huge castle and pirate ship, just the thing if you have children aged up to 14 years, who love nothing better than tearing around and climbing. Hire your cycles from the Activity Centre in the Castle Grounds. Open 7 days a week, 10am to 5pm. Cycle hire: £3.00 per hour, cycle trailer hire: £3.00 per hour, tandem hire: £3.00 per hour, trike hire: £3.00 per hour. Helmets also available to hire. Cycles and skateboards available to purchase. Full cycle maintenance and accessories available. Within the superb surroundings of the Castle Grounds is the nine-hole crazy golf course. Test your putting ability through colourful obstacles and unexpected surprises, great fun for all the family. Clubs and golf balls are available to hire from Dave Owen Cycles in the Castle Grounds Activity Centre. Open 7 days a week from 9am. Prices: Adults - £2.50, Children - £2.30. The all-weather tennis courts are floodlit to ensure games can continue into the evening and available to hire by the hour. There is a state of the art skate park in Tamworth Castle Grounds. This has been extremely well received by skateboarders, in-liners and bmxers. The park is so good that British professional skaters have been sighted enjoying the park on numerous occasions. The park has a varied layout with some contemporary skatepark features such as a 4ft tall 20ft wide mini ramp and the extremely popular Westminster hip as well as some street style ledges rails and many pads. Outdoor fitness equipment for the whole community to use in the fresh air. No membership fees, just turn up and work out for free. This is great fun for all the family. Starting from the distinctive sun sculpture, the walk gives you a feel for how the solar system is organised by young and old alike by following red rockets laid into the path.